Free, family-friendly evening of art, music and fashion at HiSAM! Admission is always free. All museum galleries will be open. Free, family-friendly evening of art and music at HiSAM! All museum galleries will be open. This is the same night as the free Art at the Capitol event across the street at the Hawaii State Capitol building! 6:00 - 9:00 PM, ground floor and second floor of the No 1. Capitol District building (250 South Hotel St., corner of Richards and S. Hotel). Doors will be open at 4:00 p.m. for the second floor Sculpture Lobby where the piano performances will begin at 4:30 p.m. 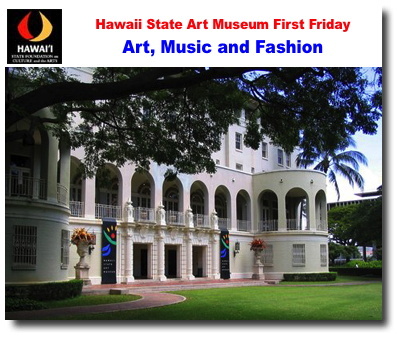 This is the same night as the free Art at the Capitol event across the street at the Hawaiʻi State Capitol building. (4:30 - 7:00 p.m.). All museum galleries will be open, including the “I Love Art” hands-on activity room. 4:30 – 5:15 and 5:30 – 6:30 p.m. Julia Akatsu Stoyanov, classical piano performances in the second floor Sculpture Lobby. 6:00 – 6:45 p.m. Slow Art Day tour. Take a slow, thoughtful guided tour with museum guide and artist Emily McIlroy! Try different strategies for experiencing artwork and see what happens when you spend several minutes studying the same piece and discussing it in a group. Meet at the second floor visitors desk. All ages are welcome; children must be accompanied by a responsible adult. An additional Slow Art Day tour is scheduled for Saturday, March 6 at 1:00 p.m. Ground Floor – Sculpture Garden6:30 – 7:30 p.m. Zenbu Records: live performances by Super Groupers, Punahele, Sanz, Nick Kurosawa, Illnomadic, and Zachtoro. 7:30 – 7:50 p.m. Fashion show: Andy South Men’s collection by Ari South. 8:00 – 9:00 p.m. Creative Lab Hawaiʻi: live performance by Izik. 6:00 – 9:00 p.m. weaving demonstrations by Gaye Chan, “stained glass” tea light art activity by April Sham, opening reception for display of artworks for sale by Contemporary Stained Glass Art Japan and Lauren Hana Chai, pop-up shops (including Gerard Paul Chocolates), and live music with DJ Toki. Temporary installations for the 2019 Honolulu Biennial art event by Bernice Akamine (Hawaiʻi), Abraham Cruzvillegas (Mexico), ʻImaikalani Kalahele (Hawaiʻi), Janet Lilo (Sāmoa), and the Mata Aho Collective (Aotearoa) will also be on view through May 5, 2019 (front lawn, ground floor display case, Room 103). Artizen by MW Cafe – “Out Of The Garden” display of artworks for sale by Jodi Endicott. Free and open to the public; all ages welcome. HiSAM galleries will be open (admission is always free). Parking available across the street in the Ali’i Place building (enter at 1099 Alakea St., cash only) or metered street parking in the area. Several TheBus lines stop in front of or close to the building. 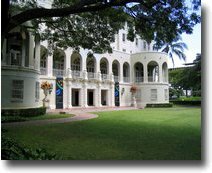 For more than fifty years, the Art in Public Places Collection of the Hawaiʻi State Foundation on Culture and the Arts has been recognized as one of the most significant collections of contemporary art of Hawaiʻi. This exhibit invites you to engage with a selection of recent additions to the collection from across the Hawaiian Islands. The thirty-one artworks acquired from eighteen exhibitions offer an insight into current trends and themes in the local arts scene and provides an opportunity to see the diversity of works being created in Hawaiʻi today. SFCA Executive Director Jonathan Johnson says “this exhibit is what’s going on in Hawaiʻi through the eyes of artists.” View artworks in the exhibit in our online catalog: STATE OF ART: new work. Doug Britt, Bai Xin Chen, Kelly Ciurej, Janet Davis, Elizabeth Forest, Yoko Haar, Dennis Hakes, Daniel Harano, Charlton Kupaʻa Hee, Brad Huck, Zenobia Lakdawalla, Tom Lieber, Robert Lober, Michelle Martin, Marques Marzan, Deyana Mielke, Yoonmi Nam, Paula Nokes, Mia O., Jon K. Ogata, Nisha Pinjani, Hiroko Sakurai, Marilee Salvator, Jennifer Stephens, Jonathan Swanz, Mark Tanabe, Masami Teraoka, Lori Uyehara, David Valdez, and Hana Yoshihata. Through a selection of works from the Art in Public Places Collection, this exhibition explores the various ways that artists play with scale, and how this in turn affects the viewer’s responses and understanding. 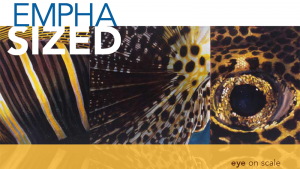 View artworks in the exhibit in our online catalog: EMPHASIZED: eye on scale. Carol Bennett, Pat Catlett, Lee Chesney, Christopher Cole, Dorothy Faison, Sally French, Dennis Hanshew, Claude Horan, May Izumi, Virginia Jacobs, Jun Kaneko, Paul Kodama, Freeman Lau, Cade Roster, Bruna Stude, Masami Teraoka, Allison Uttley, and John Wisnosky. Second floor, Diamond Head gallery. 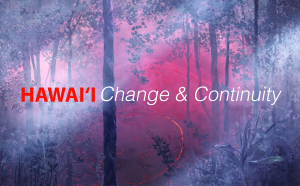 HAWAI‘I: Change & Continuity includes 130 artworks from the Art in Public Places Collection of the State Foundation on Culture and the Arts, and tells a story of the past, examining the overlapping influences of nature’s bounty and human impact on a fragile environment. 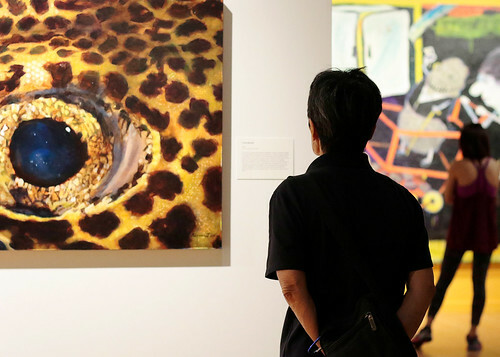 As you walk through the exhibit, you will see art that reflects on the forces of nature and man’s intrusion. Relevant quotes are placed on walls to help the viewer understand the meaning. Second floor, Ewa Gallery. View artworks in the exhibit in our online catalog: HAWAI‘I: Change & Continuity. 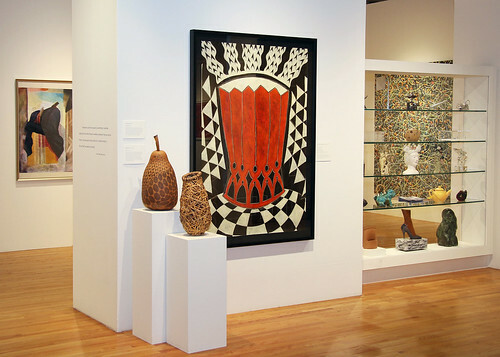 Ground floor exhibits in the shop and cafe are organized and supported by the Friends of the Hawaiʻi State Art Museum (a volunteer non-profit group) and the HiSAM Museum Gallery Shop x MORI. Please visit their websites for information about their current exhibits and events.